Photographed at Bird Rock, Catalina Island using a Nikonos V, 15 mm lens, and a single Ikelite Substrobe 150 set at 1/4 power. Garibaldi were about one foot from my lens. About the Garibaldi: These pesky little guys are a bold animal, and are afraid of no man. They are a protected species and I honestly believe they know that. Garibaldi get in your way, and often ruin photographs as they swim lazily through the photographic area. You can punch and poke at them and they will turn around and simply stick their tongues out at you. They range in size to 14 inches and are found from northern California to Baja, Mexico California. 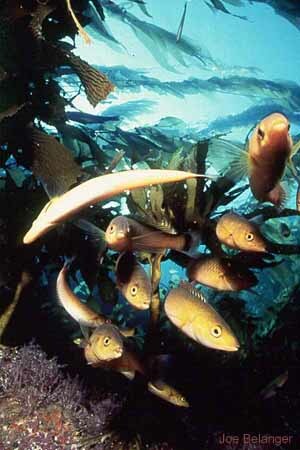 They are reef residents and are commonly found around kelpbeds. Juveniles are orange with iridescent blue spots, and are shy. Photographed at Eagle Reef, Catalina Island using a Nikonos V, 15mm lens and a single Ikelite Substrobe 150 set at 1/2 power. F-stop was set at f11. 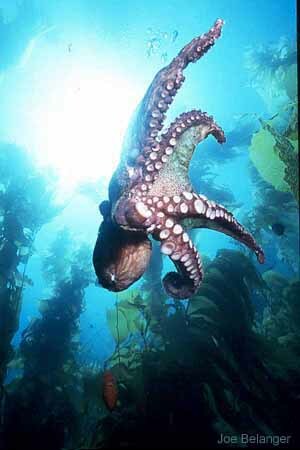 About the Octopus: Found in rocky crevices at usually middle to low intertidal zones to 150. Nocturnal feeders (nighttime) who consume crabs and other crustaceans. Octopus are considered by many experts to have the intelligence of a dog. They can rapidly change colors to match their background, so as to hide when frightened. Size is species dependent, but this one was about two feet in diameter. 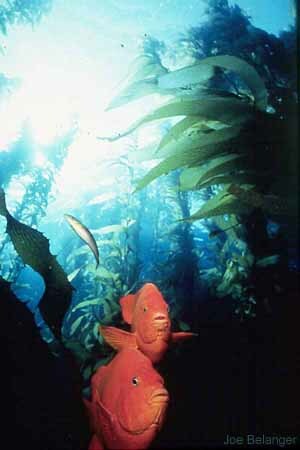 Photographed at Catalina Island using a Nikonos V, 15mm lens and a single Ikelite Substrobe 150 set at 1/4 power. 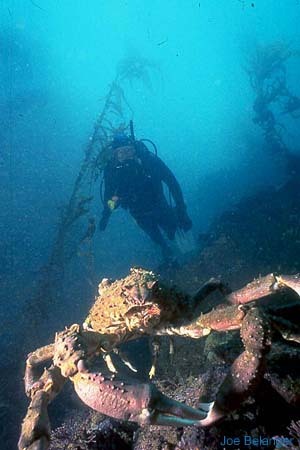 About the Sheep Crab: Found from 30 feet to 500 feet. Mean looking as you can see, but the sheep crab is actually a slow moving crab found on reefs and on sandy bottoms. They move lazily along the bottom in search of food and other crabs. They grow to about two feet in diameter from leg to leg. Photographed at Ship Rock, Catalina Island using a Nikonos V, 15mm lens and a single Ikelite Substrobe 150 set at 1/4 power. About the Senoritas: These little cigar-shaped pains in the hind quarters are very bold and, like the garibaldi, ruin many-a-photograph. But here I decided to shoot them in a wide angle format to show you how bold they are.....they surrounded my lens. Senoritas feed on a small assortment of invertebrates and pick parasites off other fish. They sleep at night buried in the sand with only their head protruding. Found generally in kelp bed communities and reef systems from 10 feet to 75 feet deep. Size to 10" (25 cm).